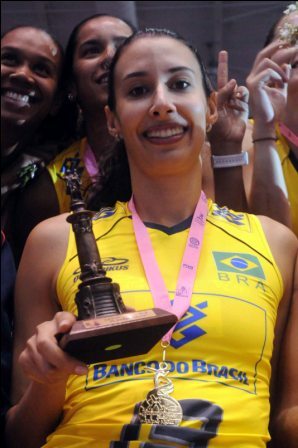 CIUDAD JUAREZ, Mexico, July 9, 2011 - Brazilian Sheilla Castro was elected the Most Valuable Player MVP of the 10th Pan American Women’s Volleyball Cup carrying her team to the victory on Saturday night. Other awards were handed out for individual performance during the closing ceremony at Colegio de Bachilleres Gymnasium. Brenda Castillo of Dominican Republic took home the trophies as Best Libero and Best Digger, while her teammates, Prisilla Rivera and Lisvel Eve received the recognition as Best Spiker and Best Server respectively. Canadian Sarah Pavan claimed the award as Best Scorer and Peru’s Elena Keldibekova was selected as the Best setter. Brazilians Thaisa Menezes and Fabiana De Oliveira also received recognition as the Best Blocker and the Best Receiver respectively.